There are two types of indicators of environmental impact: "means-based", which is based on the farmer's production methods, and "effect-based", which is the impact that farming methods have on the farming system or on emissions to the environment. An example of a means-based indicator would be the quality of groundwater, that is effected by the amount of nitrogen applied to the soil. An indicator reflecting the loss of nitrate to groundwater would be effect-based. The environmental impact of agriculture involves a variety of factors from the soil, to water, the air, animal and soil diversity, people, plants, and the food itself. Some of the environmental issues that are related to agriculture are climate change, deforestation, genetic engineering, irrigation problems, pollutants, soil degradation, and waste. Climate change and agriculture are interrelated processes, both of which take place on a worldwide scale. Global warming is projected to have significant impacts on conditions affecting agriculture, including temperature, precipitation and glacial run-off. These conditions determine the carrying capacity of the biosphere to produce enough food for the human population and domesticated animals. Rising carbon dioxide levels would also have effects, both detrimental and beneficial, on crop yields. Assessment of the effects of global climate changes on agriculture might help to properly anticipate and adapt farming to maximize agricultural production. Although the net impact of climate change on agricultural production is uncertain it is likely that it will shift the suitable growing zones for individual crops. Adjustment to this geographical shift will involve considerable economic costs and social impacts. At the same time, agriculture has been shown to produce significant effects on climate change, primarily through the production and release of greenhouse gases such as carbon dioxide, methane, and nitrous oxide. In addition, agriculture that practices tillage, fertilization, and pesticide application also releases ammonia, nitrate, phosphorus, and many other pesticides that affect air, water, and soil quality, as well as biodiversity. 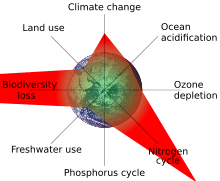 Agriculture also alters the Earth's land cover, which can change its ability to absorb or reflect heat and light, thus contributing to radiative forcing. Land use change such as deforestation and desertification, together with use of fossil fuels, are the major anthropogenic sources of carbon dioxide; agriculture itself is the major contributor to increasing methane and nitrous oxide concentrations in earth's atmosphere. Deforestation is clearing the Earth's forests on a large scale worldwide and resulting in many land damages. One of the causes of deforestation is to clear land for pasture or crops. According to British environmentalist Norman Myers, 5% of deforestation is due to cattle ranching, 19% due to over-heavy logging, 22% due to the growing sector of palm oil plantations, and 54% due to slash-and-burn farming. Deforestation causes the loss of habitat for millions of species, and is also a driver of climate change. Trees act as a carbon sink: that is, they absorb carbon dioxide, an unwanted greenhouse gas, out of the atmosphere. Removing trees releases carbon dioxide into the atmosphere and leaves behind fewer trees to absorb the increasing amount of carbon dioxide in the air. In this way, deforestation exacerbates climate change. When trees are removed from forests, the soils tend to dry out because there is no longer shade, and there are not enough trees to assist in the water cycle by returning water vapor back to the environment. With no trees, landscapes that were once forests can potentially become barren deserts. The removal of trees also causes extreme fluctuations in temperature. Genetically engineered crops are herbicide-tolerant, and their overuse has created herbicide resistant "super weeds", which may ultimately increase the use of herbicides. Seed contamination is another problem of genetic engineering; it can occur from wind or bee pollination that is blown from genetically-engineered crops to normal crops. About 50% of corn and soybean samples and more than 80% of canola samples were found to be contaminated by Monsanto's (genetic engineering company) genes. This accidental contamination can cause organic farmers to lose a lot of money because they need to recall their products. There are various cases of this such as in the corn and alfalfa industry. Among some of these problems is the depletion of underground aquifers through overdrafting. Soil can be over-irrigated because of poor distribution uniformity or management wastes water, chemicals, and may lead to water pollution. Over-irrigation can cause deep drainage from rising water tables that can lead to problems of irrigation salinity requiring watertable control by some form of subsurface land drainage. However, if the soil is under irrigated, it gives poor soil salinity control which leads to increased soil salinity with consequent buildup of toxic salts on soil surface in areas with high evaporation. This requires either leaching to remove these salts and a method of drainage to carry the salts away. Irrigation with saline or high-sodium water may damage soil structure owing to the formation of alkaline soil. Synthetic pesticides such as 'Malathon, 'Rogor', 'Kelthane' and 'confidor' are the most widespread method of controlling pests in agriculture. Pesticides can leach through the soil and enter the groundwater, as well as linger in food products and result in death in humans. Pesticides can also kill non-target plants, birds, fish and other wildlife. A wide range of agricultural chemicals are used and some become pollutants through use, misuse, or ignorance. Pollutants from agriculture have a huge effect on water quality. Agricultural nonpoint source (NPS) solution impacts lakes, rivers, wetlands, estuaries, and groundwater. Agricultural NPS can be caused by poorly managed animal feeding operations, overgrazing, plowing, fertilizer, and improper, excessive, or badly timed use of Pesticides. Pollutants from farming include sediments, nutrients, pathogens, pesticides, metals, and salts. Listed below are additional and specific problems that may arise with the release of pollutants from agriculture. Soil degradation is the decline in soil quality that can be a result of many factors, especially from agriculture. Soils hold the majority of the world's biodiversity, and healthy soils are essential for food production and an adequate water supply. Common attributes of soil degradation can be salting, waterlogging, compaction, pesticide contamination, decline in soil structure quality, loss of fertility, changes in soil acidity, alkalinity, salinity, and erosion. Soil degradation also has a huge impact on biological degradation, which affects the microbial community of the soil and can alter nutrient cycling, pest and disease control, and chemical transformation properties of the soil. Plasticulture is the use of plastic mulch in agriculture. Farmers use plastic sheets as mulch to cover 50-70% of the soil and allows them to use drip irrigation systems to have better control over soil nutrients and moisture. Rain is not required in this system, and farms that use plasticulture are built to encourage the fastest runoff of rain. The use of pesticides with plasticulture allows pesticides to be transported easier in the surface runoff towards wetlands or tidal creeks. The runoff from pesticides and chemicals in the plastic can cause serious deformations and death in shellfish as the runoff carries the chemicals towards the oceans. In addition to the increased runoff that results from plasticulture, there is also the problem of the increased amount of waste form the plastic mulch itself. The use of plastic mulch for vegetables, strawberries, and other row and orchard crops exceeds 110 million pounds annually in the United States. Most plastic ends up in the landfill, although there are other disposal options such as disking mulches into the soil, on-site burying, on-site storage, reuse, recycling, and incineration. The incineration and recycling options are complicated by the variety of the types of plastics that are used and by the geographic dispersal of the plastics. Plastics also contain stabilizers and dyes as well as heavy metals, which limits the amount of products that can be recycled. Research is continually being conducted on creating biodegradable or photodegradable mulches. While there has been minor success with this, there is also the problem of how long the plastic takes to degrade, as many biodegradable products take a long time to break down. The environmental impact of agriculture can vary depending on the region as well as the type of agriculture production method that is being used. Listed below are some specific environmental issues in a various different regions around the world. Hedgerow removal in the United Kingdom. Soil salinisation, especially in Australia. Methane emissions from livestock in New Zealand. See Climate change in New Zealand. Environmentalists attribute the hypoxic zone in the Gulf of Mexico as being encouraged by nitrogen fertilization of the algae bloom. The exponential population increase in recent decades has increased the practice of agricultural land conversion to meet demand for food which in turn has increased the effects on the environment. The global population is still increasing and will eventually stabilise, as some critics doubt that food production, due to lower yields from global warming, can support the global population. Organic farming is a multifaceted sustainable agriculture set of practices that can have a lower impact on the environment at the small scale. However in most cases organic farming results in lower yields in terms of production per unit area and per unit of irrigation water. Therefore, widespread adoption of organic agriculture will require additional land to be cleared and water resources extracted to meet the same level of production. A European meta-analysis found that organic farms tended to have higher soil organic matter content and lower nutrient losses (nitrogen leaching, nitrous oxide emissions and ammonia emissions) per unit of ﬁeld area but higher ammonia emissions, nitrogen leaching and nitrous oxide emissions per product unit. Other specific methods include: permaculture; and biodynamic agriculture which incorporates a spiritual element. 1 2 van der Warf, Hayo; Petit, Jean (December 2002). "Evaluation of the environmental impact of agriculture at the farm level: a comparison and analysis of 12 indicator-based methods". Agriculture, Ecosystems and Environment. 93 (1-3): 131–145. doi:10.1016/S0167-8809(01)00354-1. Retrieved 21 April 2015. ↑ "UN Report on Climate Change" (PDF). Archived from the original (PDF) on 2007-11-14. Retrieved 25 June 2007. ↑ Hance, Jeremy (May 15, 2008). "Tropical deforestation is 'one of the worst crises since we came out of our caves'". Mongabay.com / A Place Out of Time: Tropical Rainforests and the Perils They Face. ↑ "Deforestation". National Geographic. Retrieved 24 April 2015. ↑ "Genetic Engineering in Agriculture". Union of Concerned Scientists. Retrieved 23 April 2015. ↑ "Risks of Pesticide Use". EPA. EPA. Retrieved 23 April 2011. ↑ "Agricultural Nonpoint Source Fact Sheet". United States Environmental Protection Agency. EPA. Retrieved 22 April 2015. ↑ "Soil Degradation". Office of Environment Heritage. Retrieved 23 April 2015. ↑ "Agricultural Land Use Issues". National Estuarine Research Reserve System. Retrieved 23 April 2015. ↑ Kidd, Greg (1999–2000). "Pesticides and Plastic Mulch Threaten the Health of Maryland and Virginia East Shore Waters" (PDF). Pesticides and You. 19 (4): 22–23. Retrieved 23 April 2015. ↑ Hemphill, Delbert (March 1993). "Agricultural Plastics as Solid Waste: What are the Options for Disposal?" (PDF). Hort Technology. 3 (1): 70–73. Retrieved 23 April 2015. ↑ Seufert, Verena; Ramankutty, Navin; Foley, Jonathan A. (25 April 2012). "Comparing the yields of organic and conventional agriculture". Nature. 485 (7397): 229–232. doi:10.1038/nature11069. ↑ Tuomisto, H.L. ; Hodge, I.D. ; Riordan, P.; Macdonald, D.W. (December 2012). "Does organic farming reduce environmental impacts? – A meta-analysis of European research". Journal of Environmental Management. 112: 309–320. doi:10.1016/j.jenvman.2012.08.018.